Add bodies washing up on the beach to the growing list of problems bedeviling Brazil as it prepares to host the 2016 summer Olympics. 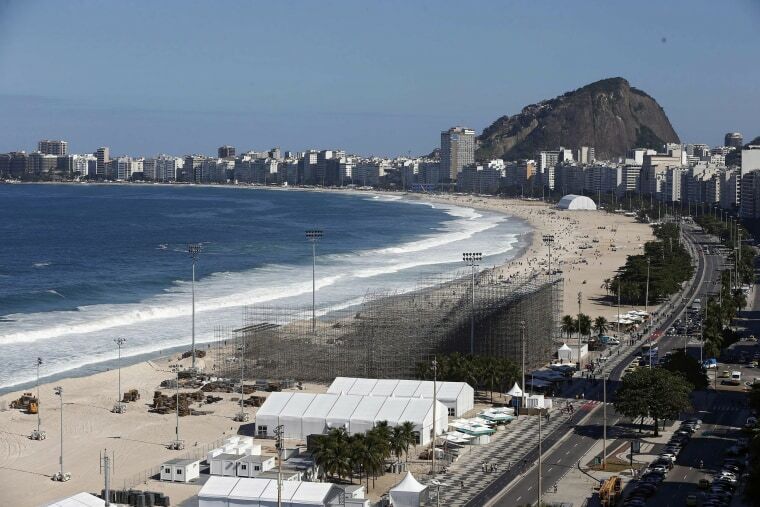 Parts of a mutilated corpse was discovered Wednesday on Rio de Janeiro's famed Copacabana Beach, just yards away from where the beach volleyball competitions will be held, police confirmed to Reuters. The severed right foot and pieces of skin were believed to be from a woman or teenager, investigators told local Rio newspaper O Dia. They grisly finds raised fresh fears that — five weeks before the opening ceremonies are to take place — Brazil might not be ready as the country contents with economic woes, police protests, a presidential impeachment, and the Zika virus threat. Just two days before to the unsettling discovery, police, firefighters and other first responders expressed their dismay by greeting arrivals at Rio’s Galeão International Airport with signs that said, "Welcome to Hell." Protesting first responders said they have been receiving late paychecks and facing poor working conditions, which they fear will impact public safety in Rio. Officers have also been without water, toilet paper and ink to print police reports, Folha de Sao Paulo reported, causing Rio police stations to shut down for eight hours in protest Monday. That same day, more than 300 officers also marched in Rio’s streets demanding full paychecks out of a concern for the city’s stability and safety. As Rio’s resources continue to dwindle, Casa da Moeda (Brazil’s mint) announced in a release Thursday that the production of documents, including passports, has been halted for a week, due to a problem with one of the machines. The Brazilian mint company, which has its facilities and headquarters located in Rio, said the defective part has been requested and will come from Germany. Rio’s acting governor said Monday the state of Rio is expecting a $860 million payout from the federal government before the Olympics after it declared a financial state of emergency earlier this month. But until that allocated money reaches the state, Gov. Francisco Dornelles told newspaper O Globo that its police force may be forced to cease by the end of the week, due to a lack of gas money. "I'm optimistic about the games, but I have to show reality," he said. "We can have a great Olympics, but if some steps aren't taken, it can be a big failure." Two days after the first responders’ protest, O Globo wrote in an editorial that the officers’ resistance efforts were actions that “border terrorism.” The media company Grupo Globo, which owns O Globo, also happens to be a major media sponsor of the 2016 Olympic games, and has established broadcasting rights of the Olympic games in Brazil through 2032. Meanwhile on the federal level, Brazil’s suspended President Dilma Roussef is awaiting the Senate to conclude its impeachment trial. The Senate has 180 days as of May 12 to decide whether to completely remove Roussef from her position amid accusations that she used funds from state banks to hide holes in the budget. The final decision is also expected to occur halfway through the Olympics, Agencia Brazil reported June 6. But officials do feel confident that one concern before the Olympics can be put to rest -- the mosquito-borne virus Zika. Health officials said on June 7 that there is a low risk visitors and athletes will contract the birth defect virus during the Olympics due to the typical cooler, drier air in August. "It is worth knowing that the incidence of the mosquito that transmits the virus is extremely low in August and September, which is winter in Brazil and the period in which the Rio 2016 Games will take place," Dr. João Grangeiro, Rio 2016's chief medical officer, told a news conference. The Zika unrest began after Brazil announced concern for the virus’ spread in the country in November, which reignited a global health emergency by the World Health Organization after it found the virus was causing serious birth defects.